As I was walking through the isles of my local warehouse club I spotted a MISTO. It's a sprayer that you put your own oil in and it works just like you would use a can of pan spray. To get the pressure into the can to spray you pump the top of the container and then spray. I've seen the stainless steel version before but not the plastic bpa free one. I LOVE IT. I can see when the oil is low and I need to refill it. The best part is there aren't any additives or 'extras' that you might find in other products that you buy at the grocery store. 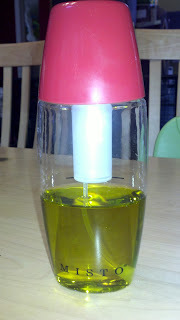 I use organic olive oil in the MISTO and it works great! If you are looking for a cheaper and healthier alternative to buying pan spray then give this MISTO a try! PS - I'm not getting paid for this info on MISTO - just passing on the info of things I find helpful for maintaining a healthy lifestyle.